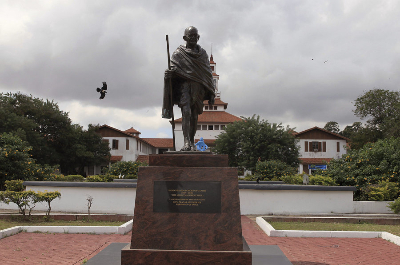 A statue of Mahatma Gandhi will be removed from a university campus in Ghana after professors launched a petition “Gandhi must fall” claiming the revered Indian independence leader was ‘racist’. The allegation that Gandhi considered Africans an ‘inferior’ race has triggered debate. Gandhi’s thinking influenced the independence movements in Africa, including that of Ghana. If we judge the Mahatma by his life, we will know – Gandhi cannot fall. What is the raging debate? 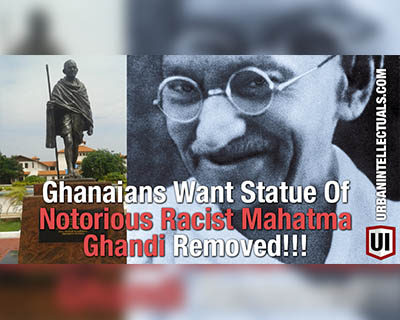 Students and professors at the University of Ghana started a campaign demanding the removal of a statute of Mahatma Gandhi from their campus because of his "racist identity," and called for statutes of "African heroes and heroines" to be erected instead. The campaign dubbed “Ghandi Must Fall” and “Ghandi Must Come Down” was started by a number of professors, students, alumni and some Ghanaians with Prof. Akosua Adomako as its leader. On October 4, it was realised that the statue had been defaced in the cover of darkness the previous night. The government has, thus, resolved to relocate the Mahatma Gandhi statue on the University of Ghana campus to ensure its safety. The statue had been unveiled at campus in Accra by Pranab Mukherjee, the president of India, in June as a symbol of friendship between the two countries. Since then there has been agitation from many students, alumni, and Ghanaians over the statue being on campus. 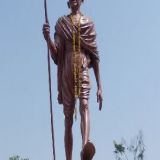 A statement issued by the Ministry of Foreign Affairs and Regional Integration of Ghana on October 5 said the allegations of Gandhi being a racist are “unfortunate verbal attacks”. ” wrote a professor in the petition. 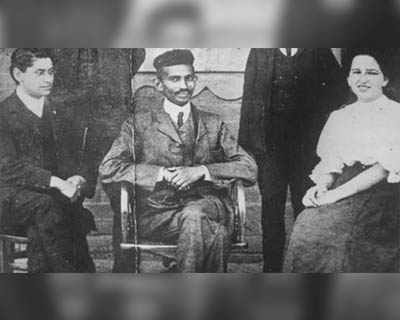 The movement has sparked a debate across many African countries after a new book by Ashwin Desai, a professor at the University of Johannesburg called “The South African Gandhi: Stretcher-Bearer of Empire”, painted a negative portrait of the Mahatma using his words from those years and also alleged that he propagated the caste system in India. When does Gandhi appear to have been a racist? The petition quotes a few remarks Gandhi made early during his career when working with a legal firm in South Africa, where he arrived in 1893 as a 24-year-old. Among those quotes are references to Africans under colonial rule as “Kaffirs” and “savages” [a derogatory term for black people with roots in Apartheid era of South African history]. A second, more damaging (Sept. 26, 1896) one, at a speech in Mumbai in 1896 Gandhi said: "Ours is one continual struggle against a degradation sought to be inflicted upon us by the Europeans, who desire to degrade us to the level of the raw Kaffir whose occupation is hunting, and whose sole ambition is to collect a certain number of cattle to buy a wife with and, then, pass his life in indolence and nakedness." He later changed his views, saying stereotypes of Africans as "barbarians" are wrong, said Jad Adams, the author of Gandhi: the True Man behind Modern India. Where are the Ghanaian people wrong? The quotes he made in his younger days should be seen in the context of the work he was doing at the time and the ethos in the country. Singling out the comments he made when he was struggling with his own career (he was yet to even begin his public campaigns), that too without context, can lead to results which do not represent the man ‘whose life was his message’. Defending him as the crusader against imperialism, granddaughter Ela Gandhi said that Mahatma Gandhi must be judged not by those words made as a young lawyer, but as the man who stood up to British imperialism worldwide, a freedom fighter and the champion of rights for the downtrodden that he became after began his activism in South Africa, that also became the inspiration for Nelson Mandela’s movement against apartheid. “If they do not want his statue then by all means remove it. But I would suggest very humbly do not discard the notion of non-violence, of compassion, of ubuntu and of respect for fellow human beings and for nature and the whole of the universe simply because these were the ideals Gandhiji stood for and was assassinated for,” Ms. Gandhi said in a letter responding to the ‘Gandhi Must Come Down’ Movement. 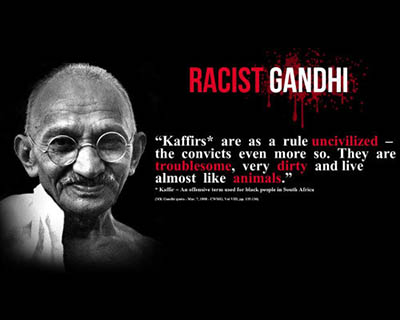 Gandhi would not have been a mentor for freedom fighters in South Africa if he was truly racist. 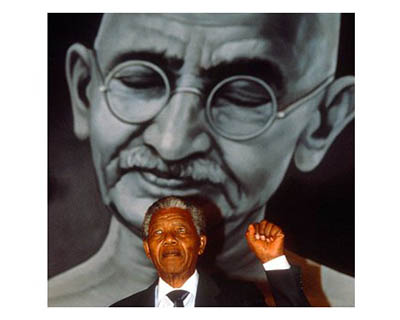 In his book: “Long walk to freedom, The Autobiography of Nelson Mandela”, Nelson Mandela asserted that “The Indian campaign hearkened back to the 1913 passive resistance campaign in which Mahatma Gandhi led a tumultuous procession of Indian crossing illegally from Natal to the Transvaal…..That was history; this campaign was taking place before my own eyes.” Gandhi’s action motivated Mandela and his colleagues, Walter Sisulu, Oliver Tambo and A. P. Mda. India’s struggle against British colonialism under Gandhi was an inspiration to a generation of African independence leaders, including Ghana’s Kwame Nkrumah, who in 1957 managed to persuade British authorities to grant Ghana independence — one of the first African nations to get it. Who else have criticized Gandhi? Patrick French, the author of ‘India – A Portrait’, has also been critical of Gandhi’s way of dealing with racism. He talks about the episode when the newly arrived Gandhi is ejected from a first-class railway carriage at Pietermaritzburg after a white passenger objects to sharing space with a “coolie” (an Indian indentured laborer). Gandhi’s demand to be allowed to travel first-class was accepted by the railway company.This according to Patrick goes on to show how Gandhi wanted to extend racial segregation rather than start a campaign against it. “Gandhi was adamant that “respectable Indians” should not be obliged to use the same facilities as “raw Kaffirs”. He petitioned the authorities in the port city of Durban, where he practised law, to end the indignity of making Indians use the same entrance to the post office as blacks, and counted it a victory when three doors were introduced: one for Europeans, one for Asiatics and one for Natives.” reads Patrick article criticizing Gandhi. 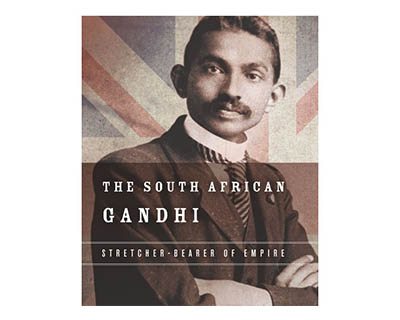 A controversial new book, “The South African Gandhi: Stretcher-Bearer of Empire”, written by two South African university professors, Ashwin Desai and Goolam Vahed, about Gandhi’s life in South Africa between 1893 and 1914, also talks of Gandhi being a racist. According to the book, Gandhi described black Africans as “savage,” “raw” and living a life of “indolence and nakedness,” and he campaigned relentlessly to prove to the British rulers that the Indian community in South Africa was superior to native black Africans. The book combs through Gandhi’s own writings during the period and government archives and paints a portrait that is at variance with how the world regards him today. How should we really judge Gandhi? 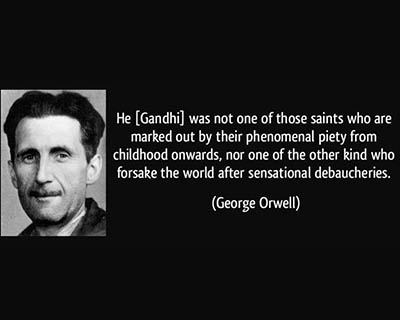 To give a definite answer, Orwell says, one would have to study Gandhi's acts and writing in immense detail, for his whole life was a sort of pilgrimage in which every act was significant. In judging a man like Gandhi one seems instinctively to apply high standards, so that some of his virtues have passed almost unnoticed. For instance, it is clear even from the autobiography that his natural physical courage was quite outstanding: the manner of his death was a later illustration of this, for a public man who attached any value to his own skin would have been more adequately guarded. And though he came of a poor middle-class family, started life rather unfavorably, and was probably of unimpressive physical appearance, he was not afflicted by envy or by the feeling of inferiority. Color feeling when he first met it in its worst form in South Africa, seems rather to have astonished him. Even when he was fighting what was in effect a color war, he did not think of people in terms of race or status. The governor of a province, a cotton millionaire, a half-starved Dravidian coolie, a British private soldier were all equally human beings, to be approached in much the same way. There was a time, it is interesting to learn, when he wore a top hat, took dancing lessons, studied French and Latin, went up the Eiffel Tower and even tried to learn the violin — all this was the idea of assimilating European civilization as thoroughly as possible. He was not one of those saints who are marked out by their phenomenal piety from childhood onwards, nor one of the other kind who forsake the world after sensational debaucheries. He makes full confession of the misdeeds of his youth. Close friendships, Gandhi says, are dangerous, because “friends react on one another” and through loyalty to a friend one can be led into wrong-doing. This is unquestionably true. Moreover, if one is to love God, or to love humanity as a whole, one cannot give one's preference to any individual person. His autobiography leaves it uncertain whether Gandhi behaved in an inconsiderate way to his wife and children, but at any rate it makes clear that on three occasions he was willing to let his wife or a child die rather than administer the animal food prescribed by the doctor. 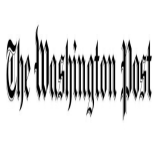 It is true that the threatened death never actually occurred, and also that Gandhi — with, one gathers, a good deal of moral pressure in the opposite direction — always gave the patient the choice of staying alive at the price of committing a sin: still, if the decision had been solely his own, he would have forbidden the animal food, whatever the risks might be. There must, he says, be some limit to what we will do in order to remain alive, and the limit is well on this side of chicken broth.